We love pineapple in our family. Pineapple anything, pineapple everything. We’ll drink the juice and eat the canned stuff, but every fruit fan knows that fresh is the best. It’s not always easy to cut a pineapple though, at least in a way that doesn’t waste fruit or look like a mess. 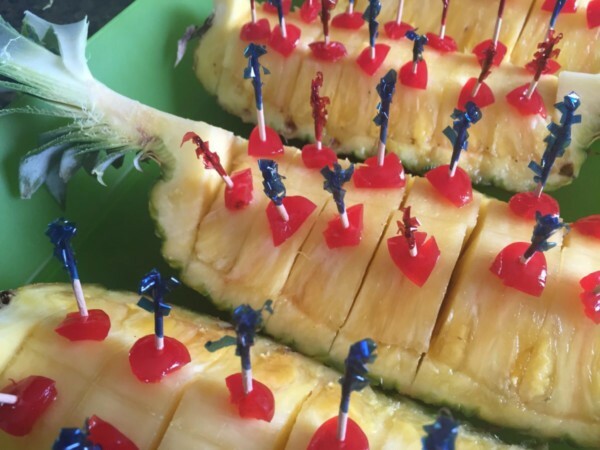 Several years ago, a friend of mine brought the most adorable pineapple and grapes spread to a party we hosted. After doting over it, I found out just how easy it was to prepare – and we’ve been doing it this way ever since. You can use your imagination and arrange your fruit tray however you’d like. Our favorite is on a square dish with the pineapple quarters framing a big pile of grapes and berries… but of course I can’t find a picture of that. 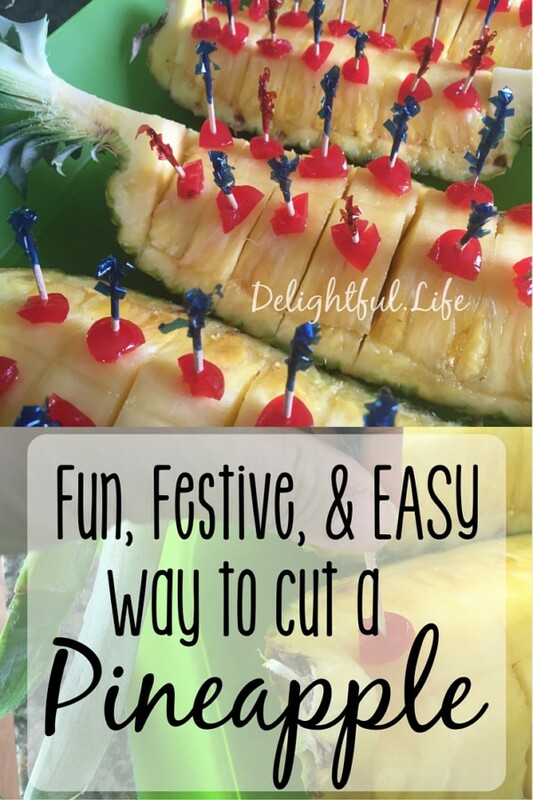 Regardless of how you finally lay it all out, let us show you how simple it is to make the pineapple part! Leaving the stem intact, cut a whole pineapple in quarters. Make a horizontal cut across the top of one quarter, removing the core. Make a second horizontal cut to separate the fruit from the skin; repeat with remaining quarters. Cut the fruit in half along the length of the pineapple. Perpendicular to the long cut you just made, make several cuts leaving the pineapple quarter in 10-20 chunks. Meanwhile, cut maraschino cherries in halves or quarters, depending on the size of your cherries and your pineapple chunks. Take a toothpick – preferably a cool-looking one! 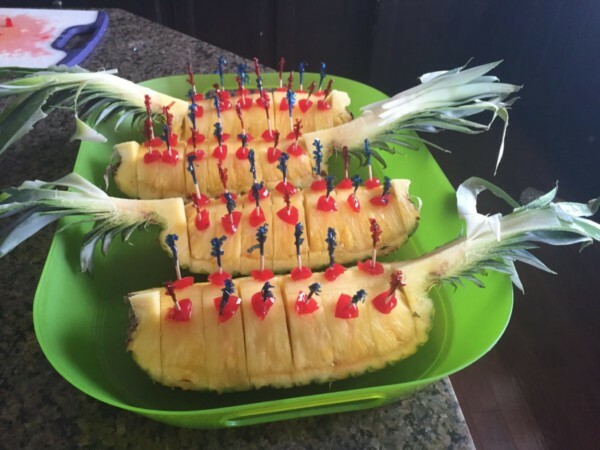 – and spear a cherry, followed by each pineapple chunk. Be warned… these will go really quickly! This display provides so much bang for your buck. It’s easy and only takes a few minutes, but looks way more intriguing and fancy than guests might expect!